As you may have noticed, Baxter is a well travelled dog. 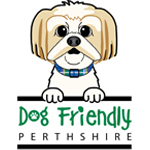 His little paws have taken him all over most of Perthshire now with his adventures and across many other areas of Scotland. 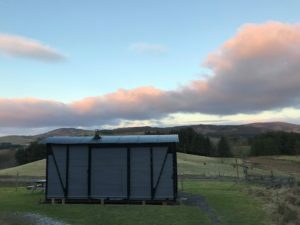 Our hearts lie in Perthshire so we were excited when we were invited to stay at Ecocamp Glenshee and to get the chance to explore an area we hadn’t yet ventured into. 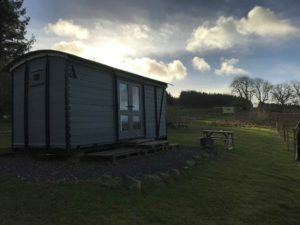 Ecocamp Glenshee is nestled away at the edge of the Perthshire countryside, located slightly off the beaten track. When you arrive you are met by the lovely and welcoming Simon and Fiona who will give you a tour and show you to where you will be staying. 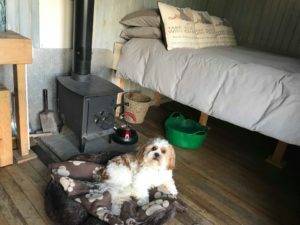 Ecocamp offers various unique, cosy and dog friendly glamping pods and cabins. The cosy romantic pods can sleep 2 people while the larger family pod can sleep 4 or The Howff can sleep 10. There are two Shepherds Huts and The Goods Wagon which is where we stayed with Baxter. The Goods Wagon is a beautiful lovingly restored railway carriage. It’s been painted in a dark grey blue which compliments its surroundings. There are lots of nice touches inside the Wagon too with lanterns and mugs with a railway theme. My favourite being the beautiful cushions with the design of an old railway ticket for dogs. The Goods Wagon comfortable sleeps 5. There is a super comfy double bed where we slept and bunk beds with another single bed that pulls out from under the bottom bunk. If there are 5 of you wanting to stay there is no need to worry about storage as there is plenty under the double bed for everyone’s things. There are cups, plates and glasses in the Wagon and Ecocamp also provides tea, coffee and sugar. You will also find a yummy treat of ‘llama poo’ aka chocolate drops waiting for you too. 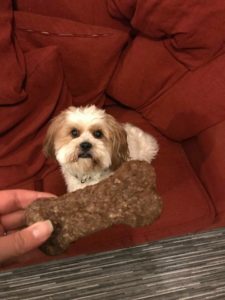 While us humans had our llama poo treats Baxter was not left out! Waiting for him on arrival was a cosy doggy blanket, a food bowl with his name on it and a homemade dog biscuit from Fiona. It’s touches like these which mean a lot to me as it shows your dog is welcome just as much as you are. My main concern about glamping in the winter would be that I was cold. The Goods Wagon has a wood burning stove and not long after our arrival we had it all fired up and any concerns about being cold were soon gone! We were so cosy for the duration of our stay and Baxter made sure we even placed his bed in front of it. Another perk of the wood burner is that we could make ourselves a cuppa by heating our water in the kettle that Ecocamp also provides. It was really nice in the morning firing up the wood burner, making a cuppa and watching the sunrise with Baxter. I was extremely impressed with the toilet and shower facilities too. While we may not have had an ensuite we were only a very short walk to the shower and toilet block which was kept very clean and every morning there was also plenty hot water. It was pretty cold weather when we stayed but there are heaters so just turn them up to your desired temperature and you will be nice and toasty when you get out of the shower. If you are wondering about cooking facilities Ecocamp have got you covered with The Bothy! It’s fully equipped with everything you need for making a meal with a camping stove or 2 double burners. There are plenty of pots and pans too along with plates, knives, forks, etc and tables to sit and eat. There is also a fridge so you have space to store any food that needs chilled and there is shelving space to store any other bits you may bring. It’s recommended to do a food shop before you arrive as there aren’t any shops close by. Just like The Goods Wagon, The Bothy has a wood burning stove and will keep you nice and warm in any cold weather. There is a clothes dryer just above the stove which would come in handy in case you do experience any wet weather. There are also electric sockets in case you need to charge your phone or torch. There are no street lights at Ecocamp, remember you are in the countryside so a torch is a must for your stay! At night time we quite liked just chilling on the sofa in The Bothy in front of the fire. Again Baxter claimed his spot right in front of it! We felt a million miles away from our busy lives back home and it was really nice not to have the distractions of the telly or our computers. There was a lovely communal space too where everyone could gather. We haven’t stayed anywhere with a space like this before and it was nice being able to chat away to another couple who were also staying and exchange stories. Not only did we have a really comfy and cosy nights sleep we also woke up to an amazing view and were greeted by the best neighbours ever, llamas!!! 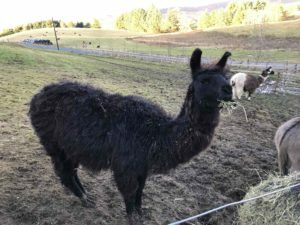 Ecocamp have 3 resident llamas and Mocha and Burrito the donkeys who live in the field in front of The Goods Wagon and the pods. In the morning we were introduced to them all while they were being fed and they are all such characters! I learned so much about them and how each have their own unique traits and quirks. I’ve now told Laurie llamas are on the list of animals we are going to end up adopting. Ecocamp is the only place I know of that offers llama trekking in Perthshire which is also dog friendly! 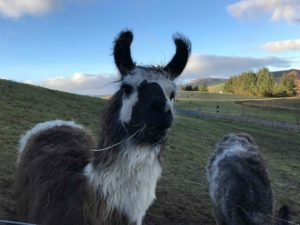 You can help feed Jet, Atticus and Bradford the llamas before going for a trek around the beautiful countryside where Simon from Ecocamp will be able to tell you more about these amazing animals and their ways. 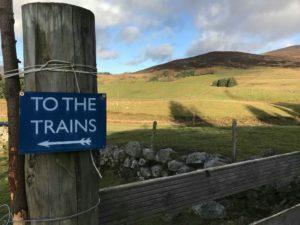 Baxter and us like our walks and there are miles and miles of Perthshire countryside available to explore with your dog suitable for all levels of walking experience. For people who maybe like to be a bit more active it’s also a very popular area to do canicross with your dog. A short drive away you also have Glenshee which has munros if you want to get some munro bagging under your belt. 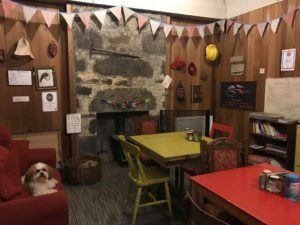 The Glenshee Ski Centre Cafe also welcomes dogs so if you do take a trip out that way, you know you will all be welcomed. I’m going to be honest and admit for quite a number of years the words ‘camping and glamping’ struck fear into me. I had these images of being freezing cold, stuck in a field, with no proper facilities or if there were any facilities they would be very basic. Ecocamp have completely changed my view on glamping. For the entire time we were they we were warm and cosy and had the most amazing views out over the hills and our neighbours the llamas and donkeys. Simon and Fiona have put so much love into Ecocamp and it’s easy to see all over the camp. We got the chance to have a nosey at some of the other pods and all have been done to such a high standard just like ours. We all had a really nice chat over a cuppa one morning along with their gorgeous doggy family and it was easy to see they knew how important dogs are to their humans and how they shouldn’t be left out when booking a holiday. That’s why dogs are welcomed throughout the camp and they include all these nice touches for their arrival. Trying to find somewhere to holiday which is happy to take more than 2 or 3 dogs can be a struggle sometimes for larger dog families. Fiona and Simon have 5 dogs themselves and have taken this on board so there is no limit to how many dogs can stay with you at Ecocamp! Just let them know at the time of booking how many paws will be joining you at your stay. As soon as we stepped foot at Ecocamp we immediately fell in love. The location, the accommodation, the bothy, the llamas, the resident goat (I forgot to mention the goat AND chickens earlier) the list is endless! Each day I would fall in love with it more and by the end I really didn’t want to leave. Add to the mixture it was dog friendly, it really is just perfect in so many ways. We are extremely lucky to have somewhere like Ecocamp Glenshee in Perthshire. It’s only a 45 minute drive from the centre of Perth but you feel like you are a million miles away. It offers the best in unique accommodation along with llamas and the warmest of welcomes. It tops Baxter’s list of one of the best places he has ever stayed and we can’t wait for a return visit. Thanks for this interesting review, sounds great!